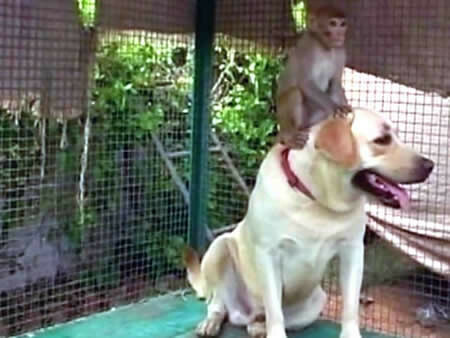 A dog and monkey have become best friends in India. They both live in a hotel and the pair sleep and eat in the same specially made cage. The monkey loves to ride on the dog’s back and head (free rides!). Although, the dog didn’t seem to be a fan of the monkey playing with his ear or his bottom. This entry was posted on Thursday, June 14th, 2007 at 7:51 am	and is filed under Other Pets, Dogs, National Dog, Cat & Pet Info, News for Cats, Dogs & Owners. You can follow any responses to this entry through the RSS 2.0 feed. Both comments and pings are currently closed. Is this dog on display in a cage all day long? for public entertainment? I do hope this dog gets some semblence of a normal dog existence. I’d be pissed too if a monkey wanted to play with my bottom!